It was a tough job, but someone had to do it, so on our trip to Québec several months ago, the hubs accepted the challenge of eating Poutine from one end of Québec City to the other. 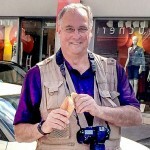 While I sampled the many versions of Poutine, it was Roger whose taste buds were tantalized by this regional specialty. So much so, he wrote this article all about Poutine. 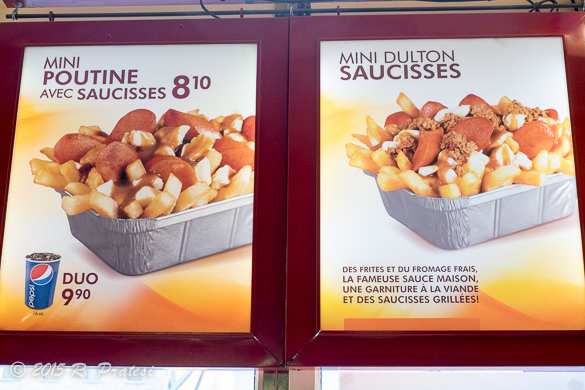 We recently visited Québec, Canada and were introduced to a regional favorite, Poutine. 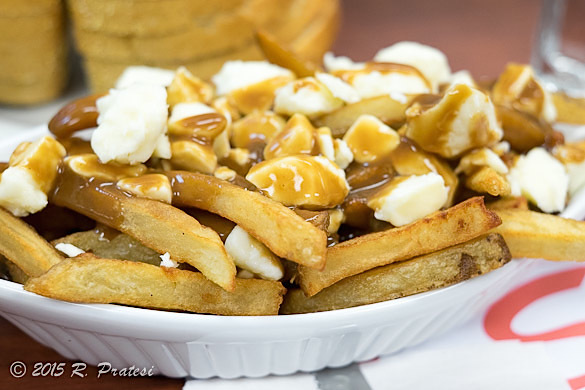 Born in Québec and owned by various towns and bars between Montreal and Québec City, Poutine was originally created as a dish with crispy French fries and fresh cheese curds. Later, brown gravy was added to keep the fries warm. It was pure comfort food that first showed up in small local restaurants and bars and as it became more popular it made its way to ski resorts, hockey arenas, and places that needed the hearty calorie laden meal to combat the cold of winter…and the after effects of too much alcohol. 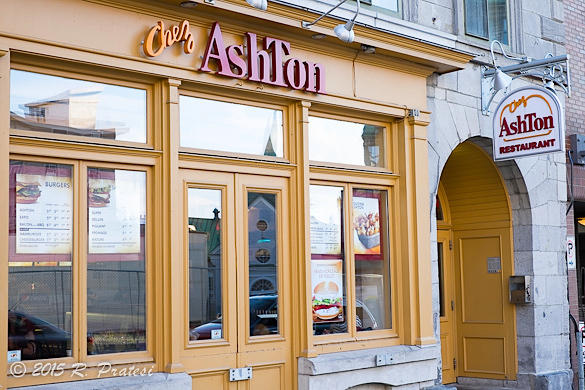 In Québec City, Chez AshTon is known as the place for “real Poutine.” They use the original recipe and are usually voted as having one of the best dishes in Québec City. 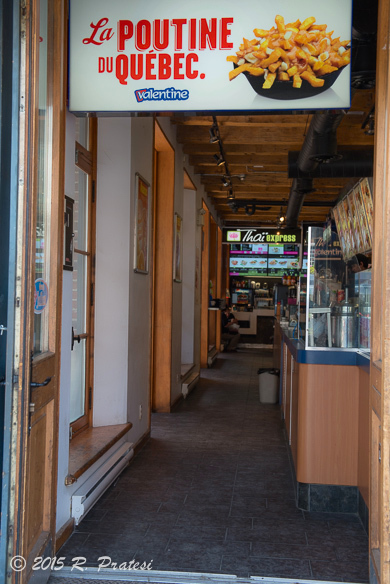 Here, they serve crispy medium thick fries with cheese curds that snap with freshness and light brown gravy to warm your tummy and calm the head (if needed). 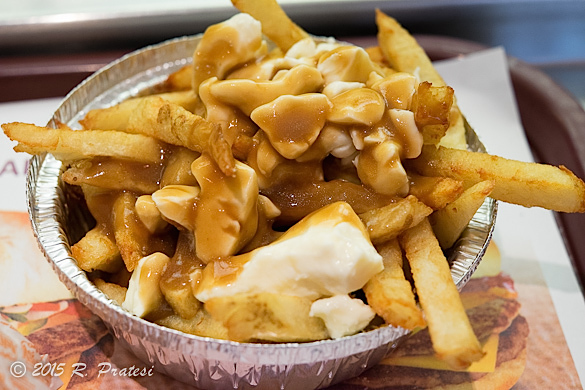 The popularity of Poutine spread across Québec and parts of Canada and has made its way into many cities in the United States. With it came contention over who’s the best, which of course led to a Poutine competition for the chefs. “Whose Poutine will reign supreme?” In February, The Poutine Challenge is held in Montreal and this year’s winner was Brasserie La Souche from Québec City. And then there’s the World Poutine Eating Championship in Toronto, where at the 5th Annual event in 2014, the likes of Matt “The Megatoad” Stonie, the No. 2 eater in the world went up against Joey “Jaws” Chestnut, the No 1 eater. In the end, it was the 130 pounder, Megatoad, that put down almost 15 pounds of Poutine in just 10 minutes to walk away with the trophy and one huge stomachache. Both Jaws and Megatoad are from the good old USA. We know how to slam down food. Like most dishes with rustic beginnings, it didn’t take long before some of the best chefs in the region began to look at Poutine as a palate to develop. The basic fries were replaced with potato wedges that are highly seasoned or thin cuts that are double fried for extra crispiness. Some are even fried in duck fat. The cheese curds gave way to more expensive fromage and the gravy… the gravy has been elevated to a sauce to rival any French culinary creation. I love poutine! Funny thing is, I have family in Montreal and in and around Quebec, and in all the times I visited there, I never *once* had poutine! But there’s a little roadside ice cream stand on U.S. 1 in Dania Beach, called Dairy Belle, that makes awesome poutine. They should be open for the season soon, and the next time you and Gwen come down to South Florida, Roger, you should check them out. Now that you’re a connoisseur, and all. 😉 If I could find the fresh cheese curd down here, I’d take a crack at making it myself.